The color should be grey greenish and of should be uniform. When touched, cement should feel uniform and cool. It should be free from lumps. Cement when thrown into a bucket of water in small quantity, the practice should float for some time before they sink. The weight of residue on sieve NO. 9 should be less than 10% and the specific surface of the cement should be more than 2250mm2 / gm. The expansion of cement should not be more than 10 mm as per soundness test. The phenomenon by which the plastic cement paste changes into hard mass is called setting of cement. The initial setting time i.e. the time lapsed from the addition of water till the cement paste loses its plasticity completely should not be less than 30 minutes and the final setting time i.e. 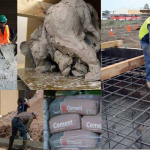 when cement paste becomes quite stiff or hard mass should be up to 600 minutes. 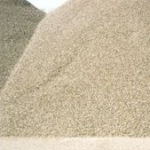 Cement mortar, [a minute of cement and sand, with propagation at 1:3] should have a compressive strength of 16N\mm2 and tensile strength should not be less than 2.5N\mm2 at the end of the 7 days.